When I crawl inside the Adirondack Iron and Steel Company blast furnace in Tahawus, N.Y., the summer day’s warmth gives way to the chill of long-abandoned places. Above me, a stone funnel rises 45 feet, widening and then narrowing to a tiny circle of daylight. The stones glisten, but they aren’t wet. The inferno that burned 24/7 in the furnace when it smelted iron ore, from 1849 to 1856, turned their faces to glass. “These were kind of the nuclear reactors of their day,” says Paul Hai, a local conservation expert who’s serving as tour guide. Radiation is one hazard visitors to Tahawus don’t have to worry about. But the furnace embodies an evergreen parable of best-laid plans. Just five years after it was built, the state-of-the-art operation shut down for good, the casualty of a global financial panic. 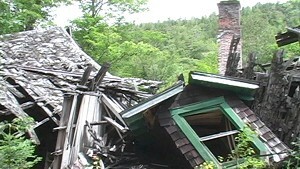 A promised railroad spur stopped short of this isolated mining settlement, located deep in the Adirondacks on the site of the present High Peaks trailhead. And the hamlet, then called Adirondac, became a ghost town. Over the course of a century and a half, this would happen to it twice. I came to Tahawus — the site’s modern name — because I wanted to explore a creepy, deserted place like the title town in the film and video game Silent Hill. Photos of the “ghost town” on the Internet raised my hopes by depicting scabby shacks in sallow, autumnal light. Tahawus is a line of ruined dwellings sitting half-buried in dense second- and third-growth forest between dead-end CR-25 and a burbling brook that happens to be the headwaters of the Hudson River. A more recent visitor, commenting on RoadsideAmerica.com, warned that Tahawus is “not so eerie anymore.” That’s because, in 2003, the Open Space Institute purchased the site from Houston-based National Lead Company and took on the mission of preserving the 10,000-acre Tahawus Tract for future generations. Today, when you call the Adirondack Park visitor center in nearby Newcomb and ask about Tahawus, you’re likely to be connected to Hai. The Rochester, N.Y., native is program coordinator at the Adirondack Ecological Center in Newcomb, part of the SUNY College of Environmental Science and Forestry. Hai believes in living history. When we meet him at the trailhead, he introduces us to two former residents of Tahawus: Ann Knox, who’s summered in the area since 1924, and David Olbert, who lived here from 1954 to 1962. That’s putting it mildly. Hai is a major Tahawus geek. As we stand in the half-full parking area at the trailhead, he unfurls a map and rattles off names of famous people who chronicled the ghost town in the 1800s: photographer Seneca Ray Stoddard, naturalist John Burroughs. “You’re lucky I’m not nailing you with the mining stuff,” Hai says later. But once we reach the blast furnace — which looms beside the road like a blackened Mayan temple — he does, in fact, nail us with the mining stuff. Lifting a bar of pig iron, Hai explains how molten ore once flowed from the furnace’s mouth. Water pumped uphill from the brook kept it from overheating. “In 1855,” he enthuses, “we’ve got water-jacketed and water-cooled machinery in the middle of this unbelievably remote site.” Much of that 125-year-old machinery now lies rusting in the bright green grass beneath picture-postcard mountain views. Without its iron ore — discovered by white settlers in 1826 — the village of Tahawus probably wouldn’t have existed. From 1827 to 1857, the Adirondack Iron and Steel Company extracted it using the best methods then available, consuming an acre of trees a day to run the furnace, says Hai. Well after the furnace went cold, in 1876, the company leased the land to a private fish-and-game club. Around the start of the 20th century, the Tahawus Club built a clubhouse — now gone — and a strip of cottages with cedar shingles and green window frames. Some of those are still here. “This was a beautiful house,” says Olbert. As her Cardigan corgi snoozes on the asphalt road, Knox, whose bright eyes and sharp recollections belie her age, recalls coming here back when club members had servants and ate on “white linen cloths.” “We ran around and did wicked things,” she says. We approach a less tumble-down house with ominous graffiti scratched on its door frame: The Shadowman. Nearby, a dull green fire hydrant stands rusted in the underbrush. “This was all bare,” says Knox of the heavy woods. A few steps down the road stands the McNaughton Cottage, circa 1834, the only remnant of the original mining settlement. A solid box with boarded windows, it stands in marked contrast to the wrecked structures around it. In Adirondac days, the McNaughton Cottage was a bank, perhaps the first one incorporated in Essex County. But it gained its fame in 1901, when Theodore Roosevelt stayed there as a guest of the Tahawus Club. When he learned President McKinley was dying from an assassin’s bullet, TR left the cottage and booked it to Washington. Knox says that, according to family lore, it was her grandfather, Roosevelt’s family physician, who sent him to Tahawus in the first place. Given its historic significance, the Open Space Institute has been restoring the cottage with plans to transform it into an interpretive center. But the days when blue bloods inhabited these rustic dwellings are long gone. In 1939, Tahawus turned back into a mining town. An “impurity” in the iron ore that had bedeviled the Adirondack Iron and Steel Company turned out to be titanium oxide — exactly what the U.S. needed on the eve of World War II. National Lead bought the land, began extracting titanium from a nearby site and evicted the Tahawus Clubbers from the cottages, which it used to house its workers. “We were completely evacuated from here,” recalls Knox. That’s when Olbert entered the picture. When his family moved here, the town was “all mine employees,” he says. A path through the grass leads to the house where Olbert grew up. Its second story has slumped backward, giving it the look of a Salvador Dalí painting. Inside, an old Smartfood bag in the rubble speaks to the presence of intruders. “People are in and out of here all the time,” says Olbert. Though Olbert left Tahawus when he was young, the ruin brings stories swarming to his lips: He remembers jumping 30 feet off the porch into snowdrifts, building a bobsled run, watching his brother shoot rocks with a giant slingshot. In those days before intense parental supervision, the Olbert kids and their friends even scaled and rappelled down the Victorian blast furnace. But local kids — or other outdoorsy types — still seem to be enjoying Tahawus. Behind the ruins runs a grassy strip where a fire pit holds recently charred logs. Lumber balanced on stones forms rudimentary benches with a view of the riverbank. Do people come here to spot sleek black otters or specters? Hard to say. But it’s also hard to call a place a ghost town when it lives in the memories of people such as Knox. She still stays at the Tahawus Club, which has relocated about 10 miles away to a gracious, 19th-century farmhouse. Olbert lives with his wife in Newcomb and owns a business that rents canoes, kayaks and mountain bikes. “We do OK in the summer,” he says. In the winter, Olbert teaches high school physical education and driver’s ed in nearby Long Lake. He hopes one of his kids will continue his business, but he knows young people have a tendency to move on — the average age in Newcomb is mid-fifties. It’s one of the grayest towns outside Florida, says Hai, but it’s no ghost town yet. To Hai, who’s adopted Tahawus and regularly shepherds outsiders through it, the place “speaks to the cycles of human occupancy in the Adirondacks” and the importance of creating “viable communities,” he says. Watch Eva Sollberger’s “Stuck in Vermont” video about Tahawus at sevendaysvt.com/multimedia.